Although indoor bike trainers are good for cold seasons, not everyone likes to use them. Some prefer old-fashioned cycling even in winter. However, considering that winter is always cold, outdoor bike cycling is not that favorable. The weather alone is a limiting factor since you have to worry about vision range, breathing, and warmth. Luckily for you, there are balaclavas, which come in handy during such weather. You see, Balaclavas are designed for cold outdoor activities such as skiing and winter cycling. This means that you can ride in cold weather without having to worry about warmth. Have you ever tried to ride your bike in the morning or on a cold day? The most likely answer is that you didn’t enjoy that ride. Why do you think that is? It is simple; you were losing too much heat. However, if you wear a balaclava during your morning rides you are more likely to enjoy the rides that you would if you only had a helmet. The best cycling balaclavas are made of different textiles depending on the price and intended use. Cheap models are made of inexpensive polyester while the premium models are made from high-quality synthetics. Your choice will depend on the level of cold and your budget. For example, balaclavas made of nylon and microfleece materials offer better wicking, while those made from thermodynamic materials tend to be pricier. If you buy a biking balaclava that is not intended for heavy cycling you might experience breathing issues. It is imperative that you purchase the best balaclava for winter as it is designed for heavy breathing. Balaclavas are designed in different ways; some have a large opening for the eyes, nose, and mouth while others have a hinged mouthpiece and nose. Although balaclavas with a large opening are good for breathing they are not good for warmth purposes as they leave your face open. The best choice here is the hinged nose and mouthpiece balaclavas as they protect your nose and mouth from cold. The hinged part also makes it easy for you to pull down the opening for easy breathing. Other designs include mouth panels and mesh nose fitted with breathing vents. While these types of cycling balaclavas look good, they are not the best option for breathing. There is also no room to wipe your nose. Balaclavas with wicking materials are highly recommended as they do a good job in keeping your skin dry even when you sweat. Wicking materials are designed to absorb moisture from your skin and push the moisture outside the fabric. Once outside, the moisture evaporates into the atmosphere leaving your skin dry. Fabrics such as cotton are good at absorbing liquids but unlike wicking fabrics, cotton does not push the liquid outside. Instead, the fabric remains wet making your morning or winter rides uncomfortable. Some balaclavas are stationary, which means they cannot be rearranged while others are stretchy and adjustable. Here your choice will depend on your likes and preferences. However, most cyclists tend to prefer the adjustable version as it is adjustable for easy breathing. You can also opt for the “hinged” balaclavas as they designed with a garment that can be raised or lowered for heat retention or easy breathing. 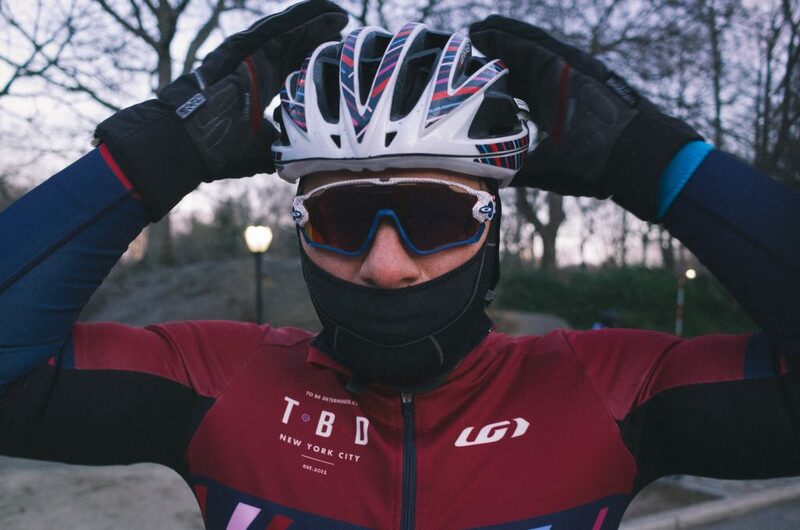 While most cyclists want to ride with glasses, not all balaclavas are designed to fit glasses. Finding a perfect match is not easy. You glasses are most likely to get foggy as the heat trapped by your balaclava is translated to your glasses as moisture. If it is absolutely necessary for you to wear glasses when cycling, you can purchase cycling glasses especially those that are fitted with air vents. Some balaclavas feature two separate apertures for better heat retention while others have a wide aperture as it allows for a better or clear line of vision. The Seirus Innovation Balaclava features a neck warmer, hood and a facemask. It is made in the USA and it is unisex. It has a neofleece 5 layer that is designed to keep you warm even in winter. The Seirus Balaclava also has a fleece-lined neoprene that blocks out wind and cold, large central breathing holes, a waterproof and breathable liner, tough outer shell, micro fleece wicking lining, and thermolite synthetic insulation. Its design features a contoured facemask that provides warmth and makes it easy to breathe. It also has a 4-way stretch that offer the utmost comfort. Unlike most cycling balaclavas, the Seirus Combo Clava has a flat seem construction that fits hats, headwear, helmets and goggles. As its name suggests, Chaos CTR Tempest is made from Micro Flex fleece, which is a lightweight fabric that provides unparalleled levels of warmth and comfort. The fabric also boasts of wicking properties that help push the moisture out of the balaclava. It has a Lycra binding that seals out the elements making it the best balaclava for extreme cold or winter. It also has a shaped bottom that prevents excessive gathering. The Chaos CTR Tempest is not only ideal for cycling but also snowboarding, hunting, and skiing. The Original Turtle Fur Fleece is a heavyweight balaclava that is designed for cold weather applications. It can be worn with a helmet, which makes it an ideal option for cycling. The balaclava features two layers of fur fleece. The fur fleece is not only soft but it also keeps your head warm. As for the hood, it is designed to hug your head in a streamlined fabric that joins with the fur fleece neck at the sides and the back. This ensures that your head is warm and protected from wind and snow. The streamlined construction keeps snow out of your jacket. The Multi Tasker Pro features a multi-functional hinge that offers 100% protection from elements. The multi-functional hinge is adjustable thus you can move it up or down for easy breathing. You can wear the Multi Tasker Pro as a balaclava, a neck gaiter, or a balaclava with a facemask. The windshield fleece features a fabric that is not only breathable but also waterproof. It has a Lycra binding and a shaped bottom that provides full coverage, prevents excessive gathering and seals out the elements. Pearl Izumi Balaclava features the thermal fabric that combines warmth, breathability and excellent moisture transfer. It also features the Lite Fabric Panel, which has windproof and water resistant properties. The Pearl Izumi has an ergonomic design that easily fits under a helmet. The Fantastic Zone Balaclava has a long headband that rests on your shoulders keeping both your head and neck warm. It features double layer thickening, warm design with breathable properties. It is also lightweight, soft, machine washable and wrinkle free. The Fantastic Zone Balaclava has a high tear resistance, hypo-allergenic fabric and flat-lock seems. When all these features are combined they provide excellent protection. You simply cannot go wrong with the Fantastic Zone Balaclava. The Fantastic Zone Balaclava might not be the best option for you especially if you wear prescription glasses or even sunglasses. The Upmall Winter Balaclava comprise of a fleece fabric that is not only comfortable and soft but also easy to wear. The Winter Balaclava is designed to cover all parts of your head, neck and face except the eyes. It has improved design, which features a different sewing angle for a better fit. The Upmall Balaclava is perfect choice for you since it is versatile. You can wear it as a neck gaiter, ninja hoodie, helmet liner, neck warmer or even a polar hood. The versatile balaclava offers superior protection and is a perfect fit for men, children and women. It uses special engineered polyester fibers to provide the perfect balance between absorbency, durability, wicking, abrasion resistance, and breathability. The new design features an extra long neck for better wind protection. It also has a thin fabric for improved versatility without having to sacrifice on properties such as warmth. The balaclava has an improved sewing angle that allows for better comfort. Brace Yourselves Fellas Winter is Here.